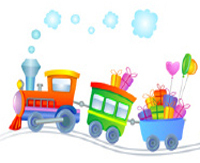 Train theme birthday party favors, cake decoration, toys, gifts & more. Train Party is dedicated to bringing you the unique train theme party favors available for that special occasion. These party favors are small in-expensive gifts that may be given to all little guests at a party as a thank you for their attendance, and also to serve as a souvenir. Compliment the decor of your event with these special railroad party favors. These elegant party favors will add that touch of class to your special event which will make your train party a unique and memorable experience for all that attend.